Yes I know, I tend to exhilarate from time to time with describing hotels and places but I can‘t help being passionate about great and surprisingly good hotels. And because I am currently so open describing myself, I also admit I have never heard of VIK Retreats before I had a closer look onto hotels in the wine region of Chile. Only when I went to Jose Ignacio in Uruguay (the upcoming hotspot in South America) I realized what a big number these small boutique hotel group is. It‘s not just a nice hotel brand having three properties in Uruguay and one in Chile, no it‘s the beginning of something very interesting in the hospitality industry. Having stayed at Aman Sveti Stefan, Four Seasons and Ritz Carlton properties as well as my favourite brand Rosewood, I was kind of sure I have seen what seemed to be the peak in hospitality. How can a small and yet unknown hotel group be better than the industry‘s leading brands you ask? Well, that‘s the moment when you should open Google and search for Mr Alexander Vik. Not only is he one of the wealthiest persons in the world, he can also be described as clever and innovative. Now by looking at the pictures of the VIK properties it makes sense that they are more similar to a museum than any random luxury hotel at the end of the world. The USP of VIK Retreats is the small size never exceeding a maximum of 48 rooms. While I will talk about the properties in Uruguay later on, this review is about the only property outside the origin country - the VINA VIK CHILE. Situated in a parallel valley of the word famous Colchagua valley, VIK Chile is located on top of a hill in the back of the town Millahue. One valuable recommendation before continuing reading: a rental car makes life A LOT easier as the entire surrounding is so breath-taking and worth being discovered. And I can assure you I had the same thoughts and concerns, however the roads in Chile are as good as the Italian ones (if not better) so there is absolutely no need to worry in terms of safety and accessibility. Also because I need to be flexible when travelling, a rental car for these huge dimensions is simply necessary for us. Our journey began in Valparaiso, then continued to Clos Apalta valley to finally end in Millahue. So I have to admit the drive was already breath-taking, driving through autumnally alleys with the sun shining through the trees. Generally Chile has been one of the most pleasant surprises in my life and this feeling didn‘t end once we reached the end of the main road which stopped at a huge wooden gate that stated „VINA VIK“. It was one of these gates and bumpy roads (that began behind the door) that says, there is everything but a luxury hotel. Being taught by Tuscan luxury hotel‘ driveways, I didn‘t hesitate a moment and so we have been driving along the different wine grapes until we glimpsed at what seemed like a spaceship that landed on a spot that couldn’t have been less developed in terms of tourism (there was not a single wine bar or restaurant on the way). The road became even bumpier and I was slightly beginning to lose self esteem in my driving skills, however at a certain time we did it and arrived in another world - yes that‘s the right way to describe this out-of-the-world hotel (not just in terms of design). Two ladies were already standing on the bottom of the stairs leading to „heaven” welcoming us in a friendly way. While one took care of the car and luggage without hesitation, Camilla from the Guest Experience team accompanied us towards the living room of the hotel and introduced us to our home for the next three days. Our eyes fixed on the pool table already, she kind of lost our attention and only got it back when she asked us about the horseback ride she booked on the last evening. A wine tour has been arranged as well and it‘s the point we shall let you know that VIK Chile comes with a price tag but includes an all-inclusive board, which in the end makes the price a fair deal considering the stunning setting, many activities and more gorgeous accommodation. Since they didn‘t expect me travelling with my colleague Lukas, they had to change the king bed setup to two twins, so we were shown a beautiful table on the terrace of the restaurant and introduced to the family style lunch menu. I think if you are reading this paragraph still you‘re definitely planning to go to Chile and did already first research on your travel destination. Therefore it is no secret that Chile is not famous for it‘s cuisine. Honestly, it‘s hard work being situated next to Peru, the number one country for foodies. Therefore, the dinners were nothing too spectacular except for the property we stayed before and the VIK. I can only imagine what a huge logistical effort it is to offer such a stunning food concept, however at VIK we were finally blown away. The steak was perfect and all accompaniments were perfectly fitting as were the three side dishes we were served to share, consisting of pasta, vegetables and tomato salad. Wine pairing for lunch was a bottle of La Piu Belle - my personal favourite wine of the VIK winery. After an amazing lunch we were ready to head to the room and thanks to a front desk attendant we already received the keys during lunch. At this point it is important to mention that all 15 rooms at VIK are designed by a different artist and therefore in a different way. With our suite named „Norge“ we expected sleek Norwegian design, tough were surprised with the opposite. We entered the suite and were welcomed by a massive glass front opening onto the vineyards and the west facing mountain ridge. The centre of our room was a classy sofa below an art piece that seemed to be from Norway. Furthermore the bedroom was equipped with a writing desk, two extremely comfy twin beds (and I can gladly say the bedding was the best on our entire trip and therefore the best hotel bed in Chile), an antique sideboard as well as a huge wardrobe with a minibar that remained untouched (of course it was included as well and featured beer, water and soft drinks). Me as a bathroom junkie, would call the bathroom the main highlight of our suite. Completely dipped in grey and black stone, it was one of the most unique baths I have ever seen. While some would say the shower is totally unpractical, splashing all over the bathroom as there is no glass separation, I was totally blown away by the idea of an open shower. On the other side was a toilet, double vanities, a make-up mirror and a bath tub. There were two bath towels per person, along VIK branded toiletries (an okay in South America as the available brands are not comparable to the European options) a hand cream, VIK bath salts and light switches even I was unable to control - ending in keeping the bathroom lights on over night. Generally, I would say the fact that there is no introduction or description of the light controls is their only downside, as it was annoying not being able to switch on a moderate light before going to bed. However having said that, housekeeping was extremely good and turn-down service came with a special water and some chocolates plus they replaced toiletries, too - which they normally don‘t in Chile. After having settled we decided to head to the gorgeous infinity pool overlooking the entire valley belonging to VIK. With plenty of sun loungers, we had no privacy issues and there was rarely the occasion that more than 8 of them were occupied. 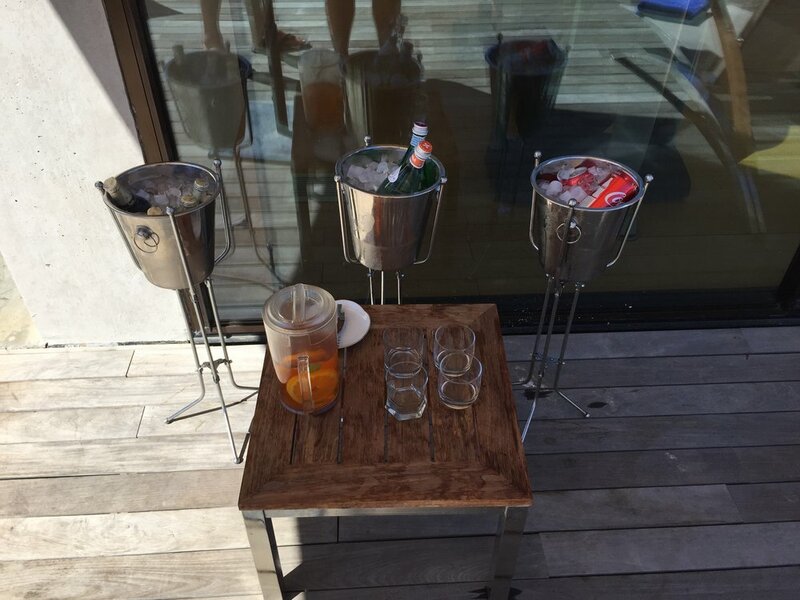 Next to the pool access, there is a small bar with cooled beer, San Pellegrino & Acqua Panna as well as several soft drinks - replaced every hour, but all choices were available all day. Right behind the pool was the gym with state-of-the-art TechnoGym equipment as well as a yoga room and access to a small but lovely spa area on the floor below the gym. If you pass by the gym there is a game room with Playstation, more games and ping pong table. While it looked quite entertaining, Lukas and me preferred the pool table in the heart of the living room. Actually I can‘t remember a place and activity that personally set my heartbeat to a minimum at maximum relaxation as a round of pool in the living room of this stunning property. The wind breezing through the hall, the kind and attentive guest experience team filling our glasses with water and delicious cocktails and me competing with Lukas in Pool - that‘s one perfect holiday. When the sun began to set, it was time for the Cocktail hour and all the in-house guests gathered around our pool table, with our minds being still focussed on the game. You can only imagine the picture of us two in bath shorts and linen shirt with the other guests already being dressed up in evening dresses and jackets. When the room finally emptied, we took a shower, changed for the evening outfit too and were ready for another pleasant surprise at dinner. Service at dinner was always somewhat more formal than at lunch and they prepared a four course menu rather than the two course lunch. The first two courses (there is always one cold and one warm starter) are accompanied by the entry-level Milla Cala wine while for the main follows the highlight: the VIK (their most upscale product). As mentioned previously the food was extremely good and service - despite some small errors such as delayed bread service or no glasses at breakfast - personal and dedicating. Especially the supervisor and the ladies in the restaurant team were extremely friendly and always had the time to chat with us. Breakfast was nothing to forget writing about as it has been one of the most upscale ones during our time in Chile. While variety wasn’t huge, the products were of highest quality and the eggs benedict really well. Service at breakfast was very friendly as well and they always brought us more orange juice whenever we asked for it as there are no glasses on the buffet. After lunch there was a guided tour through the famous winery of the Vik estate, where we were driven down the road in the SUV. Inside the winery we got to learn how they produce the wine and also how to do a tasting the right way. It was really good to see how such a process really works down under in Chile. When we came back we have booked a horseback riding which was done in a group of 4 plus the guide. She was very dedicated and explained us the personality of each horse so we could better lead the horse and to make the most out of the tour. We did ride nearly 2 hours which was way more than we expected being an included amenity in the price. We were blown away and expectations exceeded once the sun set over the valley and the museum like hotel began to stand on the hill in orange like a spaceship that just landed in that moment. If it fits into the landscape? 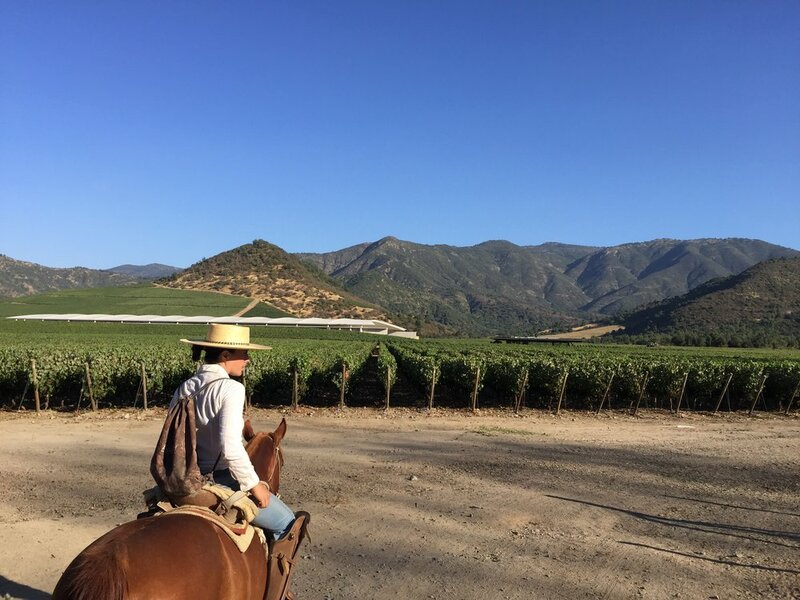 Well I think it’s exactly that place Chile needed to become famous in terms of luxury travel and I am sure Mr Vik did an amazing job in developing this idea to create one of the world’s best hotels in the near of Colchagua Valley. For us, a total 9.5 out of 10, I am blown away and the unique design really makes this hotel a special place. Staff to guest ratio being very high adds its contribution to a perfect hotel and with an all-inclusive board really including the top of the top drinks and food, absolutely worth the splurge. BUT: go there before everyone does - prices can rise extremely fast. Is it worth it? Totally!